Croplands Equipment offers a range of sprayer equipment for chemical spraying applications in agricultural farms, orchards and vineyards. Linkage Quantum Mist sprayer fans deliver exceptional coverage and assist with disease control, according to Queensland grower Alf Strano. 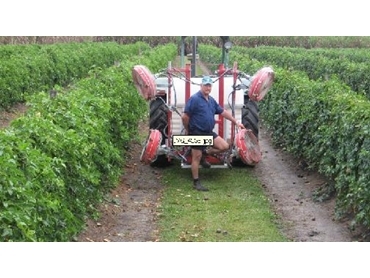 Mr. Strano uses a 700-litre Linkage Quantum Mist sprayer to spray his passionfruit vines. “This system provides exceptional coverage. I can direct spray straight onto the crop, it saves me a lot of time,” said Mr. Strano. Quantum Mist spray technology targets the chemical directly onto the canopy delivering exceptional coverage for maximum crop protection. The spray heads in these sprayers are purpose-built to deliver optimum airflow and consistent airspeed across the five-blade fan area. The fast air thrust can deliver up to 2500 RPM and provide up to 30% more coverage than traditional air blasters. Quantum Mist provides concentrated application of target spray resulting in less chemical drift. With flexible angling of fan heads and adjustable proximity to the crop, direct air movement gives growers superior control and even distribution of chemical spray. The Linkage Quantum Mist features a 500-litre or 700-litre UV-stabilised polyethylene tank with rear-mounted pump and 3-point filtration system. The heavy-duty galvanised frame delivers maximum strength and durability. Two or four QM380mm Quantum Mist fans can be easily mounted on fully adjustable arms and brackets. The fans are driven by tractor hydraulics while the sprayer unit connects to the tractor and is driven by the PTO, making Linkage Quantum Mist the ideal set-up for specialised horticulture and vine crops. Quantum Mist spray technology is ideal for a variety of applications including tree and vine crops as well as ground cover crops. The system can easily match grower needs across all growing conditions.